Picture college is from the last day of Newham Heritage Week, when Gill and I walked from Forest Gate (and back) for a tour of Mill House in 3 Mill Island, Bromley-by-Bow. 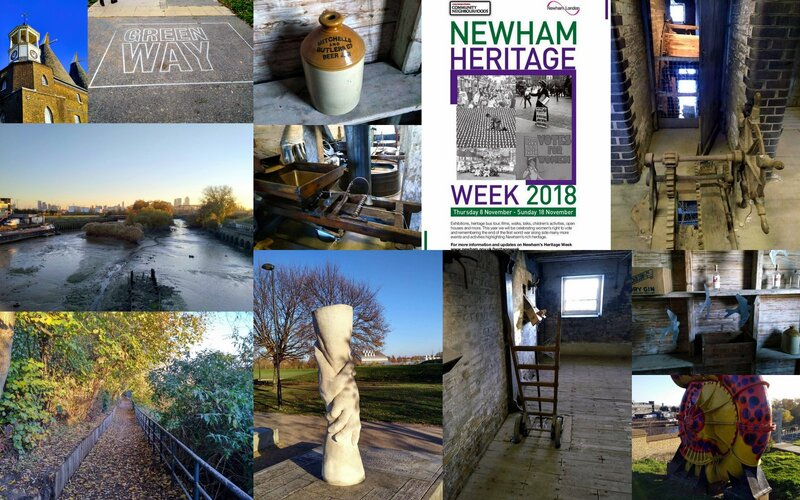 We walked via the back streets of Forest Gate, thorough West Ham Park, the Green Way then along the newly reopened "Long Walk" footpath path to 3 Mill Island. I use to walk/cycle this route for many years when I worked in my housing office near Roman Road, Bow. I am sure that the early "Big Brother" TV series used to be filmed nearby? The old "Bridge of Shame" has gone but part of the old footpath route is still blocked off. I must find out why. Nearby is the beautiful "Clasped Hands" Workers Memorial Day statute in 3 Mills Green. The Mill House in 3 Mill Island, Bromley-by-Bow is a hidden Newham historic gem. The Mill House is a Grade 1, 18th Century listed tidal mill. "Originally built in 1776, on a man-made island on an existing pre-Domesday site, it is the largest surviving tidal mill in the world". The Tour of the Mill House was fascinating, it is amazing that there has been a working water mill on this site since around 1380 to 1941. I joined "Friends of the Mill House" at the end of the tour. I missed the nearby Mill Island London Gin tasting tours this year but will make a special effort to attend next year!